I very nearly stopped watching the Netflix show, Stranger Things, in the first three minutes, even though it is the kind of show I like. Government conspiracy horror? Yes, sir and/or ma’am, I’m your guy! But it started in 1983 and some kids were playing ADVANCED D&D. So, like, the party is attacked by troglodytes and then “the” Demogorgon shows up. Demogorgon is a proper name, fools! And there’s no adventure where the party fights the very low level troglodytes AND DEMOGORGON. Trogs are, like, less than one HD, and Demogorgon is the baddest mo’ fo’ in the AD&D Monster Manual! PLUS, the mini of Demogorgon is CLEARLY a WOTC Aspect of Demogorgon mini from much later than 1983. Why write a satire of Atlas Shrugged? I’ve been reading about early America, colonial days up to the American Revolution, mostly. Of course, before the English got around to exploring things, the Spanish were the most prolific North American explorers. One of my predictions is about to come true: the burger chain, Wendy’s, wants to get rid of it’s human workforce. Apparently, they’ve crunched the numbers and think that paying humans is too costly. I wrote a story, Robo-Burger, about a burger chain that was purely automated. In the story, the automated burger joint was the tipping point to a revolution. Starting a blog feels weird. I know I should have one, as an indie writer, but how to start? Like with all writing, I decided to start by starting, even though the odds of anyone reading this are low. 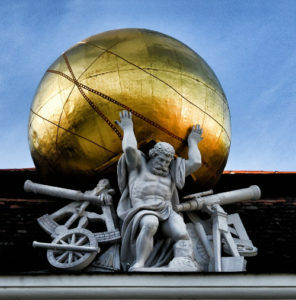 I am starting the research for a new project, whose working title is Atlas Stumbled. It is a satirical, unauthorized sequel to Ayn Rand’s Atlas Shrugged. In the process of doing research, I often find much to discuss (or about which to rant), so that’ll be good feeder material for the blog!